Ocean's Eleven was a clockwork heist film, and that it happened to be funny and witty was an aside. The sequel, though, was not everyone's cup of tea – a “look, famous people are hanging out together” kind of film with a heist as the by and by. Director Soderbergh and his crew have this time upped the ante with a precise heist executed, but with some light self-referential jokes thrown in. They have decided to take the heist more seriously, but not necessarily the entire proceedings, with the film as light and frothy as anything. In that sense, this is the perfect heist flick – a good robbery, and the cast having a great time. I absolutely had a blast watching it, too. In a year full of drab and uninteresting threequels, this one stands out as a worthy addition to its canon. In fact, the film is so full of character moments and gags that it is hard not to grin the whole time while watching the film. Even so, the heist fan in me was a little disappointed. I'm not entirely certain this would work, and while the character moments are down to earth, the derring-do they display with the resources they manage to get is a bit… outlandish, I suppose? I hate to use that word, but there you go. A warning about the film – don't try and make sense of it if you haven't watched the first two films. I didn't have a problem with that, because any sort of hand-holding would have been condescending, and so not in keeping with the tone of the film. Of the ones who know Danny Ocean (Clooney), and his right hand man, the always eating Rusty Ryan (Pitt), you'd be glad to be plunged headlong into the proceedings. 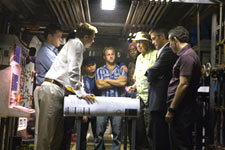 Their old friend Reuben Tishkoff (Gould) is shortchanged in a land deal by real estate mafioso Willie Bank (Pacino). The menacing way in which Pacino delivers his initial betrayal is a good return to form too. This sadly leaves Reuben with a heart condition, and the crew decides to take revenge. The plan is to loot half a billion (these numbers in these films are so huge that you just go with the flow and not blink an eye when they mention them), and also the diamonds that Bank has collected as rewards. They enlist back the whole crew (Julia Roberts isn't there though, by the way), and also their old nemesis Terry Benedict (Garcia). None of these repeat players are given any sort of introduction or even a character establishing shot. The film is brief, and moves from one shot to the other with breakneck precision. This is a really smart decision from the screenplay writers. The pacing gives them room to give each character equal time, and oft neglected players get their due bits. Casey Affleck and Scott Caan steal the film in one of their subplots, and Don Cheadle gets room to truly display his comic timing. Clooney and Pitt are conspicuous by their presence as the ringmasters. For those who are calling the shots, they should have had more solid subplots than just standing and looking cool. Matt Damon as Linus Caldwell has always been the awkward guy in the group, and he gets to do more this time round, rounding off his character in little moments and visual tics. But the way Pacino seamlessly integrates himself in the whole family of cast members is amazing. He always belonged in the Ocean's franchise. Despite the things that click, there are things that go wrong, too. The decision to give the heist the most importance also was bizarrely behind the film laying most of its cards down fairly early. As thievery films go, there is no moment where you think that this might not work, even with the imaginary conflicts. There is no wonder or amazement, just the resignation that these cool people will very obviously succeed. Also, as much as you praise the pacing of the film, it still does not have a forward momentum that will thrill you. There is a mechanical precision to the film, and none of the organic nail-biting moments of great heist films past. Even so, this is a film purposely constructed with the idea of making you have a good time, and it is very good at that. For a fun-filled popcorn munching time at the theater, nothing beats it this summer. Better than Ocean's twelve but I liked Ocean's Eleven better. Anyway a good movie to enjoy on a weekend. Oh: Samrat Sharma is back again. fullhyd.com has 700,000+ monthly visits. Tell Hyderabad what you feel about Ocean's Thirteen!